USS Salem is the third and last ship of the Des Moines class of heavy cruisers. She is comparable in size to some of the famous dreadnoughts of World War I. Her tremendous firepower is perhaps Salem's most important feature. The main battery of nine 8-inch guns were loaded automatically from the ammunition handling rooms to the gun muzzles. They were capable of firing at a rate nearly four times faster than any others of the same or larger caliber. While her armament was awesome, Salem never once fired her guns in anger. For eight years she served as Flagship of the Sixth Fleet in the Mediterranean. In 1953, she was the first ship to arrive at the earthquake-devastated Ionian Islands of Greece, where her crew worked for days caring for the injured and distributing supplies to the homeless. For her efforts, Salem earned the praise of the King and Queen of Greece. Throughout her career, she played host to many distinguished visitors, among them U.S. Ambassador to Spain John D. Lodge, Under Secretary of the Navy Thomas S. Gates, and the Shah of Iran. 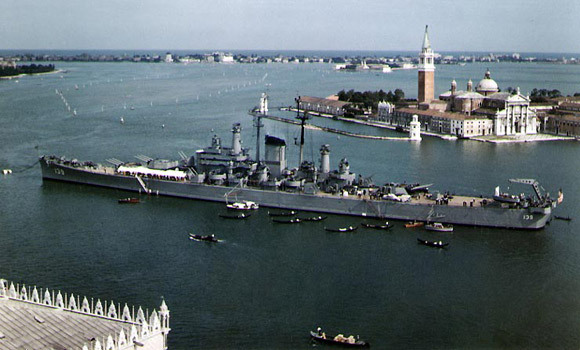 Salem was decommissioned in 1959. She returned to her Fore River Shipyard "home" in October 1994, and opened for visiting in May 1995. Salem is home to the USN Cruiser Sailors Association Memorial, USS Salem Exhibit, USS Newport News Exhibit and the Military Archives and Research Center. Salem has self-guided and docent-guided tours available for visitors. Salem conducts youth group overnight encampments.